Can Do Online Availability Check + Reservation bookings at all Hotel Listing pages above -- plus Amenities, Maps, Pictures, & Ratings. There are often evening bands at various Virginia beach oceanfront restaurants. We have "reviewed" on a page here! Near the south end of Virginia Beach you are near the Rudee Inlet so you can watch boats coming and going - and often some parasail launchings. Many of the newer Resorts are at or toward the North end of Virginia Beach such as the new "North End" Ocean Beach Club Resort complex. You can often get bigger discounts and " cheap " vacation rentals approximately a block from the beach - not Ocean Front, but some good Virginia Hotel deals are often available. Tip If you are checking on Resorts by address, note that Atlantic Avenue is the Street that runs along the length of Virginia Beach - about a block off of the ocean - in front (west) of the Resorts which are next to the ocean and beach. Odd street numbers on Atlantic Avenue are Ocean Front. Even (eg. "820 Atlantic Ave.") street numbers are on west side of Atlantic Avenue and are stretching it a LOT to say "Ocean View" since they are slightly over a block away from the ocean and generally have oceanfront resorts between them and the ocean. They do however, often have easy access to the Beach and Boardwalk. 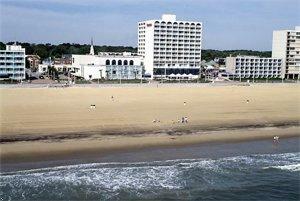 You may even find a "cheap" Virginia Beach vacation rental Hotel. Oceanfront and non oceanfront listings are shown. Click on the "B & B/Inns" Tab on the above page for User Ratings and comparison prices of 5 Virginia beach area Bed and Breakfast's & Inns. Just in the Virginia Beach, VA area for a night or two? Check out our Virginia Beach VA Hotel Info - with Hotel Rate ranges and Detailed Virginia Hotel Info + many Pictures of Hotel exteriors, amenities, and rooms. Includes Hotel Descriptions and Star Ratings, Amenities lists, Maps, Photos, and Room Availabilities for your selected dates -- can even make online Hotel Reservations. To "North End" Oceanfront Virginia Beach Vacation Rentals page - Vacation Condo Resorts North of the Virginia Beach Pier nearer the new North End Ocean Beach Club Resort complex. Near Ocean Beach - Virginia Beach rental condos page - Resorts 1 to 2 blocks from the ocean beach - for usually slightly less expensive & affordable (aka. "cheap") Virginia Beach Condo Rentals. Add a few days to your Virginia Vacation or take a seperate fun mini-Vacation. Check out the discounted and cheap Getaway Vacation Lodging Package Links on our new Timeshare Vacation Promotions page - direct Links to Vacation Getaway Discounts & Deals in Virginia and other US Beach Vacation Weekend and Getaway Escape Destinations. Please send us any SE Virginia Hotel tips or good Virginia Beach Hotels which you have discovered that are not mentioned here. Your Top Picks for SE Virginia Hotels would be of interest to our "viewers." Send to us on our Your Top Picks & Comments Page. Thanks! Attached photos to go with the Virginia Hotel comments are always interesting to all! Send your Favorites to us on our Top Picks & Comments Page Thanks! Top Pick Virginia Beaches and Vacation Guide Books: - Southeast Virginia vacation beaches & Attractions Books & Guides - with With Virginia Beach Condo Rentals and Beach Front Dining Info.